GRILL DIRECTIONS: Cut steak into 1-inch pieces. Place steak, mushrooms, bell pepper and zucchini in resealable food storage plastic bag. Pour dressing over steak and vegetables; add marjoram. Seal bag; turn several times to coat. Refrigerate at least 2 hours to marinate, turning occasionally. Heat grill. Remove steak and vegetables from marinade; reserve marinade. Alternately thread steak and vegetables onto six 12 to 14-inch metal skewers. Brush with reserved marinade. When ready to grill, place kabobs on gas grill over medium heat or on charcoal grill 4 to 6 inches from medium coals; cover grill. Cook 6 to 8 minutes or until steak is of desired doneness, turning 2 or 3 times and brushing occasionally with marinade. Discard any remaining marinade. To broil kabobs, place on broiler pan; broil 4 to 6 inches from heat using times above as a guide, turning 2 or 3 times and brushing occasionally with marinade. Balsamic vinegar is a rich, sweet Italian vinegar made from white grapes. The vinegar gets its deep color and flavor from years of aging in wooden barrels. 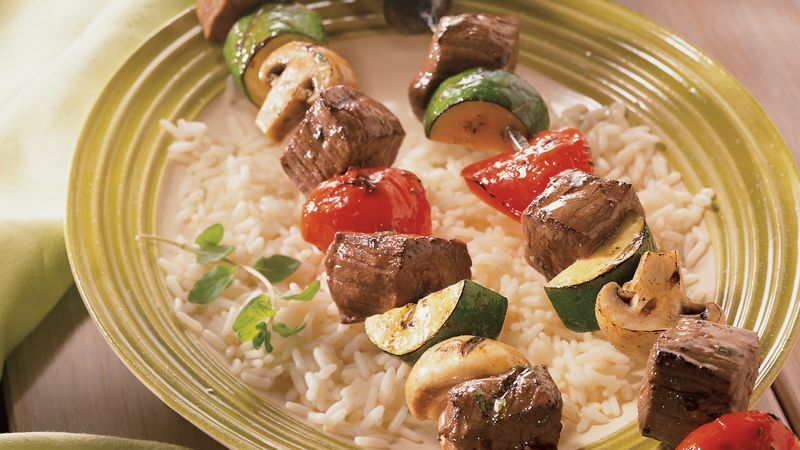 Cut vegetables for the kabobs large enough so that they will not break apart when pierced with the skewer. Marinades left over from raw meat, poultry and seafood can be brushed on food during cooking. Be sure to allow a few minutes of cooking time to thoroughly heat the marinade. Because it contains raw meat juices, do not serve leftover marinade with cooked food. However, a cooked sauce can be created from leftover marinade by boiling it for several minutes. Cooking the marinade makes it safe to eat.